I heard a lot of people say Star Trek Into Darkness was mainly inspired by Star Trek II: The Wrath of Khan and Star Trek: Nemesis. While there are definitely some homages to those two films, I would argue that the film that Star Trek Into Darkness was most inspired by is The Godfather Part III. I’ve done several Movie Matchups involving Star Trek movies in the past, even comparing the entire series to the Rocky and Karate Kid series. And it’s time once again to return to this wonderful franchise and point out how it boldly went where others have gone before. Each film incorporates real-life events into a fictional story. A group of leaders get strafed by an aircraft. The main character gets pulled back into a leadership position after the bloodbath. Several characters go to a distant place to uncover a mystery. Many of the characters want to protect their family above all else. A father tries to remove his daughter from a dangerous situation, only to put her in even greater peril. An important character is killed in the end. Now we’ll go into greater depth on each of these points. In keeping with a series tradition, each film includes a bit of fictionalized history in its story. 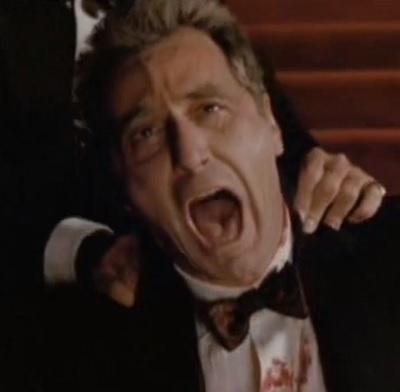 The Godfather Part III takes place during the transition to the short-lived Pope John Paul I in 1978. 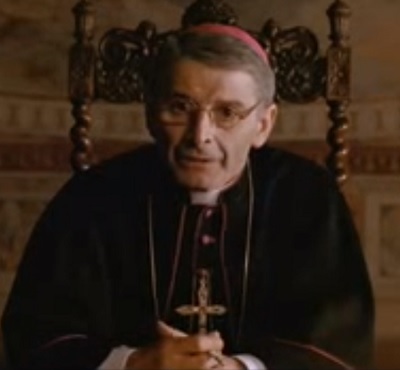 The film postulates this pope was murdered for mafia-related reasons. 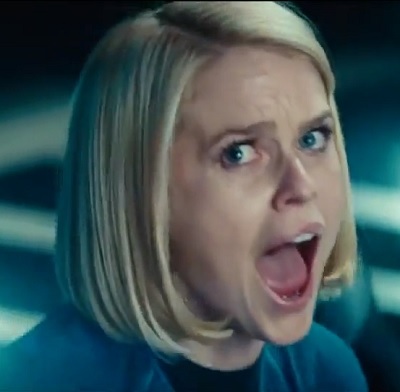 Star Trek Into Darkness involves a terrorist attack on a metropolitan area, which leads to ethical discussions about retaliating and killing terrorists without a trial. This is clearly meant to be analogous to the September 11, 2001 bombing of the World Trade Center and the Pentagon, and the ensuing U.S. war on terror. The most obvious similarity between these two films is the scene in which a group of leaders are slaughtered by a helicopter-type aircraft. 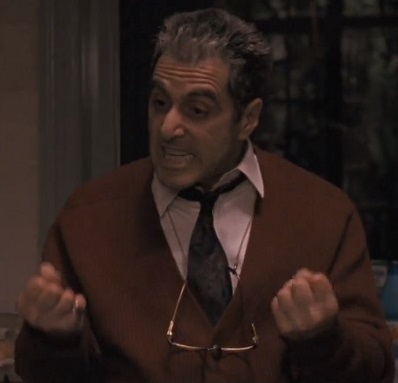 A vengeful mob boss locks Michael Corleone and dozens of other mob bosses into a room in a skyscraper and sends a helicopter to kill them all. Michael and a few of his friends barely survive the attack. James Kirk and Spock are among the attendees of a meeting of the heads of Starfleet who get ambushed by the villain Khan Noonian Singh, who proceeds to kill as many of the leaders as he can. In the wake of the massacre, the main character must return to his former leadership role. Michael wants to get out of the mob business, but he is forced to take on that ugly role again in order to protect himself and his family. Unfortunately, he suffers a stroke shortly after the attack, so he isn’t able to personally retaliate against his enemies, but his nephew Vincent does his dirty work for him. Kirk was reprimanded for violating the Prime Directive and was about to be stripped of his position as captain of the Enterprise. But when his mentor, Christopher Pike, is killed, Kirk is reinstated and sent on a dangerous mission to seek revenge on Khan. The main cast goes to a faraway place to discover the truth about their enemies. Michael takes Vincent and a few other trusted associates to Sicily in an attempt to root out his enemies. Kirk, Spock, and Uhura travel to the Klingon home world to capture Khan. In both cases, the heroes discover that the conspiracy against them lies far deeper than they had anticipated. The main characters are primarily motivated by a desire to protect their family. Since the first Godfather film when Michael became a mobster to protect his father, everything he has done has been to protect his family. It’s ironic that those things have included killing his brother and turning his back on his wife. Kirk and Khan are also motivated by protecting their “families.” Kirk pays a heavy price to save his ship and crew from certain death, as we’ll soon see, and Khan is willing to do anything to save his crewmates. There are several other examples, as well, including Admiral Marcus and a Starfleet officer at the start who kills himself to save his dying child. A father tries to protect his daughter, but his actions end up having terrible consequences. Michael desperately tries to break up his daughter’s budding romance with her cousin Vincent because he fears she will suffer as Vincent delves deeper into the mob. He forces Vincent to promise he will break up with her before he allows Vincent to become the head of the Corleone family. Unfortunately, Mary is still at risk, even when she’s at Michael’s side. Carol Marcus, the daughter of a shady Starfleet admiral, surreptitiously joins the Enterprise crew on their trip to Klingon space. When Admiral Marcus’ secret plan is revealed and he threatens to destroy the Enterprise, he beams his daughter off the Enterprise so she won’t suffer with her shipmates. 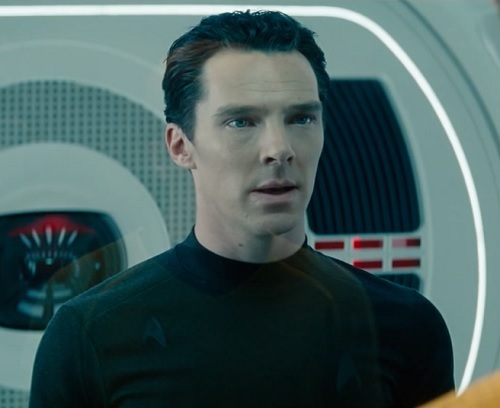 However, Khan soon gets aboard the admiral’s ship and proceeds to do serious damage to Carol. A main character dies in the end. This goes along with the previous section. An assassin wounds Michael and accidentally kills Mary in cold blood. Michael is horrified that in spite of all his attempts to protect his family, he is unable to save his daughter from the same fate as his first wife. Two deaths in Star Trek Into Darkness resemble the one in The Godfather Part III. The first death comes when Khan cripples Carol and brutally kills her father. This is an interesting reversal of the events in the other film. The second death comes when Kirk restores power to the engines of the Enterprise to save it from crashing into the Earth. Unfortunately, he gets a lethal dose of radiation in the process, and Spock must watch helplessly as his friend takes what appears to be his last breath. This is a clever callback to the end of Star Trek II. It’s a little lacking because they find a way to bring Kirk back from the dead shortly after that, but they did the same thing to Spock, so I’ll give them a pass. I am not saying that Star Trek Into Darkness is a ripoff or even the same film as The Godfather Part III. I’m simply saying that many aspects of it appear to have been inspired by that earlier film. Whether it was conscious or unconscious on the writers’ part, I don’t presume to know. I’m just excited to see where the continuing voyages of the Starship Enterprise take us next time. All images are the copyright of Paramount Pictures. This entry was posted in Movie Matchups and tagged action movies, films, movie review, movies, science fiction, sequels, star trek, the godfather. Bookmark the permalink.